GOTTA CAMP 2018: By Day and By Night! It’s almost summer (no, really!) and around here that means one thing – it’s almost time for Camp Gottalikachallenge! For years we have run one of the oldest creativity summer camps in the nation! The last several summers, our overnight sessions have filled to capacity, and families have asked for more options. We’re excited to be adding two Day Camp sessions this July! Get more details on our Camp page! Camp Gottalikachallenge is a fast-paced adventure in problem-solving! Imagine fitting a whole year of DI into one week, and you’re starting to get the idea. If you attended the NH-DI DIve In! event in January, you’ve already met some of our energetic and talented Camp Staffers. Camp days are filled with hands-on learning and challenging activities in a caring, supportive environment. Campers are encouraged to share their talents, to take risks, to recognize their similarities and differences, to be inclusive, and to have fun! Day Camps are open to any child entering 4th – 9th grade. No prior experience in creative problem solving is necessary. Campers should have an enthusiasm for group activities, curiosity, a sense of humor, and enjoy a challenge! Financial assistance is available for all sessions. 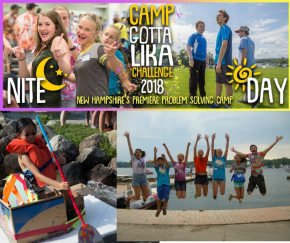 For more information or to register, go to https://nh-di.org/camp ! Email Camp Director Lou McKenna with any questions at lou.mckenna@nhicc.org.